Estilo Steel and Glass Canisters have a pretty interesting design. They currently have a 4.3 star rating on Amazon, but do have a fair amount of critical reviews that we will touch on. Hey, nothing is perfect. But are these food containers really worth your money? Let's find out. Estilo Steel and Glass Canisters have a slightly misleading name. From the name of these containers, you would think that they are made from a combination of steel and glass, and I guess that is partially true. However the complete canister is actually made from glass and it comes with stainless steel sleeve that fits over it. This brings down the quality a bit but not by much. The steel sleeve is to protect the glass from any damage, allowing the steel to take all the hits that would otherwise permanently damage the glass. However, from the information I have, I am unsure how much protection the sleeve actually provides. Due to the glass build design, these are going to be a bit heavier than either steel or plastic containers. However, this also means that they are highly durable. But because of the design, these are not meant to be portable. Mainly, they are meant to house pastas, beans, and other dry foods for later consumption. Not so much to store leftovers in the fridge or to take on the go. However, as an at home food storage, the Estilo Steel and Glass Canisters are great at their job. The Estilo Steel and Glass Canisters are pretty easy to clean. The product page recommends that you hand wash them with soapy water and wipe dry immediately. Unfortunately, these food containers are not dish washer safe, which is a bit disappointing. But because they are made of glass, they are pretty easy to just wipe clean and you will not have to worry about bacteria or mold growth. The design of these is very sleek. The steel sleeve gives them a cool, modern look and feel. Making them a very dapper addition to any kitchen. Plus, they save space due to their vertical design. So these will fit side by side in most cupboards or simply in the corner of your kitchen counter. The Estilo Steel and Glass Canisters feature an airtight sealing. This basically means that anything you put inside will be as fresh as it was before you stored it. This is achieved, surprisingly, by a screw on lid. Usually when you see an airtight seal, it is done with latches and a silicone sealant. But this is achieved using a screw on lid, which is pretty impressive. A really nifty feature that you get with these food containers is a window. May not sound super cool but it makes knowing what exactly is in your storage a whole lot easier. Because the entire canister is made from glass, the steel sleeve has an oval hole on one side that allows you to see through the glass. It also adds a tranquil and satisfying feel to the containers as well. These Estilo Steel and Glass Canisters are pretty well sized. You get a set of 4 with each purchase. They are sized at 63.3 oz (1875 ml), 43 oz (1270 ml), 33.8 oz (1000 ml), and 20.2 oz (600 ml). The variations of size allow for creative and easy storing of anything, really. I was not able to find a whole lot about this company unfortunately. Actually, it is a bit weird. Because the name Estilo is not featured on the sellers page. These are either sold new through Great Carpenter Store for a whole lot of money, or through Amazon.com exclusively. Nowhere did I see a seller option for Estilo, which is very strange. 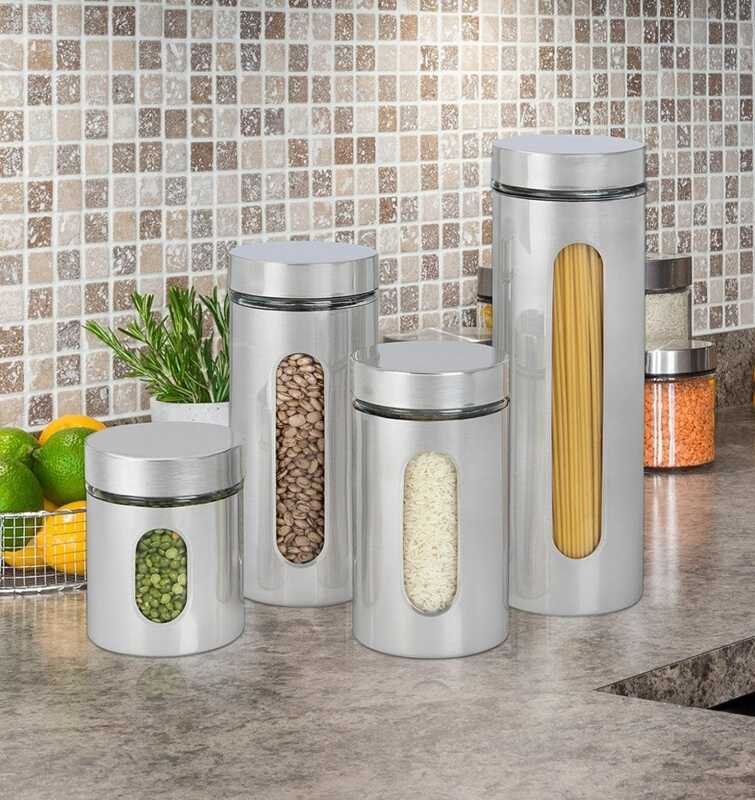 There are several great things about the Estilo Steel and Glass Canisters. First of all, they are made from glass. Plus there is a stainless steel sleeve that fits around the canister that protects the glass from any damage. This makes these containers not only durable, but easy to clean. The window feature is very handy, especially when storing a lot of dry foods all together. While solid, untransparent containers force you to either label or open each one to find out what's inside, these make it easy to know exactly what is in each canister. Another great feature of the Estilo Steel and Glass Canisters is the build quality. The glass is incredibly durable and can hold up against accidental drops or bumps. Just do not get to rough with them. Glass is still glass and it will break. Finally, the design makes these canisters very space savvy. Instead of a wide design, they are built using a tall, vertical design, which saves space and allows you to place them side by side instead of stacking. While the glass build makes these very durable, it does have its drawbacks. They are pretty heavy, and that can make them hard to store on a shelf or in a cupboard. However, you should be fine if you decide to leave them on your kitchen counter. One big drawback of the Estilo Steel and Glass Canisters is that they are not dishwasher safe. I am unsure as to why that is, being these are glass and steel, but the product page recommends that you hand wash them. But because these are made mostly for dry foods, there should not be much cleaning required anyway. The last drawback that many customers have noticed is that the opening is pretty small. The diameter of the circle at the top of the canister is much smaller than anticipated, which can make it difficult to scoop anything out or reach your hand in. It almost requires you to tip the container over to pour the contents out, which can be frustrating and hard seeing how heavy these are. Not being dishwasher safe and having a small opening at the top can be pretty big deal breakers. For most people, life is very busy. And having to wash the canisters by hand can be pretty annoying and time consuming. Plus having that small mouth just makes things even more inconvenient. Also someone also mentioned that the steel sleeve did not fit snugly around the glass leaving a slight gap that caused them to slice their finger when trying to pick up the canister. This can be a huge issue if this is normal for these containers. However, they might have been a hiccup in the normal design. Either way, there are a few things that bring down the quality of these canisters quite a bit. Overall, the Estilo Steel and Glass Canisters have a lot of great features, but are held back by small inconveniences. While they do not ruin the containers completely, it may be enough to turn some people away. That being said, if you want to try these out for yourself, they are exclusive to Amazon Prime members for $19.99 sold by Amazon.com. So if you are a prime member, may be a good idea. For any other information, including the best food storage containers, check out the rest of Green and Growing. Here are some top questions that I found for people seriously considering buying the Estilo Steel and Glass Canisters. Are these BPA free? Yes, even what little plastic that is used in the design does not contain BPA. What are the heights of the canisters? The tallest is 12 inches, the shortest is 5 inches.